Run-on repeats of a hexanucleotide sequence in the C9ORF72 gene are the most common genetic cause of amyotrophic lateral sclerosis (ALS) and frontotemporal dementia (FTD). According to a March 29 study in Science Translational Medicine, a poly dipeptide produced by these expanded repeats infiltrates the cerebrospinal fluid of expansion carriers, even before symptoms strike. Led by Leonard Petrucelli at the Mayo Clinic in Jacksonville, Florida, the paper’s 79 authors reported that levels of CSF poly(GP) varied widely between carriers, but held steady in each person throughout the course of their disease. Dieter Edbauer of the German Center for Neurodegenerative Diseases in Munich told Alzforum that soon-to-be published data from his lab agree. “Poly-GP in the CSF may be an excellent trait marker [for expansion carriers], rather than a state marker for C9ORF72 disease,” he said. 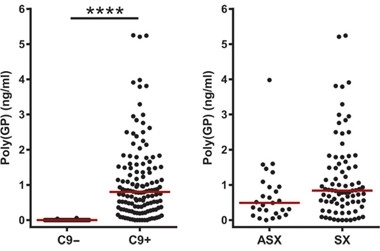 Petrucelli and colleagues also reported that antisense oligonucleotides aimed at the C9ORF72 expansions triggered a reduction in poly(GP) in patient cells, and in the brains and CSF of mouse models. “This important study demonstrates that poly(GP) proteins in cerebrospinal fluid (CSF) can serve as a biomarker to gauge the effectiveness of specific treatments for C9ORF72-related ALS/FTD, such as antisense oligonucleotides (ASOs) that target GGGGCC repeat RNA,” commented Fen-Biao Gao of University of Massachusetts Medical School in Worcester. Within the first intron of the C9ORF72 gene, the GGGGCC sequence repeats up to 30 times in healthy people, but hundreds to thousands of times in people with ALS and/or FTD. Sense and antisense transcripts from the expansions aggregate into foci that sequester crucial RNA binding proteins. Dipeptide repeats translated from these toxic transcripts also aggregate and wreak havoc in neurons (for review, see Gendron and Petrucelli, 2017). Animal studies have indicated that both toxic entities can be taken down using antisense oligonucleotides (ASO) aimed at the expansions (see May 2016 news), a strategy that has already found success in a recent trial for spinal muscular atrophy (see Nov 2016 news). Phase 1 trials for C9-targeted ASO therapy have yet to begin for ALS, but are expected in the near future. During such trials, it would be ideal to know if ASOs engage C9ORF72 expansions and reduce the production of dipeptide repeats in patients, researchers agree. To that end, Petrucelli and colleagues previously developed an antibody-based assay to detect poly(GP)—the most soluble of the five different dipeptide repeats translated from the expansions. Based on findings from a small number of samples, the researchers reported that expansion carriers had significantly more CSF poly(GP) than controls (see Aug 2014 news). To further validate this biomarker, co-first authors Tania Gendron, Jeannie Chew, and Jeannete Stankowski in Jacksonville and Lindsey Hayes of Johns Hopkins University in Baltimore tested larger numbers of expansion carriers and controls over time, including both asymptomatic and symptomatic carriers. Colleagues from multiple institutions extracted CSF from 227 volunteers. Samples were then analyzed at Mayo, and came from 83 C9-ALS patients (including 12 with both ALS and FTD), 24 expansion carriers diagnosed with diseases other than ALS (including FTD and AD), and 120 people with a normal number of repeats—deemed “non-carriers.” Of those non-carriers, 57 had ALS, four had FTD, 10 had AD, one had primary lateral sclerosis, and 48 were healthy controls. Levels of poly(GP) were significantly higher in expansion carriers, though concentrations varied by as much as fivefold. While poly(GP) trended higher in symptomatic carriers compared to carriers without symptoms, the difference was not significant. The researchers also tracked poly(GP) longitudinally in 33 expansion carriers, including nine asymptomatic and 24 with ALS or ALS-FTD. Surprisingly to Gendron, levels appeared stable over six to 18 months. Further, among carriers the researchers found no significant correlations between poly(GP) and disease onset, duration, symptom severity, disease type, or any behavioral impairment tested. However, women had lower levels than men. Why poly(GP) levels vary so much among expansion carriers is unclear. While varying expression levels of repeat DNA may explain it, the researchers are also investigating the length of the repeats. Longer polypeptides host more antibody binding sites, and thus could boost the poly(GP) signal, Petrucelli said. However, the researchers also pointed out that in a clinical trial, each patient would serve as his or her own control, with poly(GP) measured before and after treatment, so comparisons between patients would not be crucial. As to why levels held steady in each patient over time, the researchers pointed out that poly(GP) is likely produced by many neurons in the brain, of which only a small subset degenerate. Therefore, while poly(GP) released by dead motor neurons may increasingly contribute to the total as the disease progresses, it would be unlikely to rise above the steady production in neurons throughout the brain, the researchers reasoned. This would also explain its detection in asymptomatic carriers, they said. For CSF poly(GP) to serve as a useful pharmacodynamic marker in ASO clinical trials, it would need to reflect target engagement. To test this, the researchers turned to patient cells. They cultured both lymphoblastoid cell lines generated from patient blood samples as well as neurons differentiated from induced pluripotent stem cells (iPSCs) derived from patient fibroblasts. The dipeptide repeats appeared in lysates from both and also in the culture media, indicating that the cells somehow secreted it. Extracellular poly(GP) correlated with the amount found inside the cells. Finally, the researchers treated lymphoblasts and neuronal cells with ASOs targeting the first intron of C9ORF72. These nucleotides were chemically modified to promote digestion of C9ORF72 RNA via endogenous RNAse H. In response, poly(GP) in the culture media dropped, as did the number of RNA foci and aggregates of dipeptide repeats in the cells. To test the ASOs in vivo, Gendron and colleagues turned to mice developed by Petrucelli’s lab, which express 66 hexanucleotide repeats from an adeno-associated virus that is injected into the brain. By six months of age, the animals’ neurons are chock-full of RNA foci and dipeptide repeat inclusions. The researchers injected 500μg of C9-ASOs into the right ventricle of the brains of four- to 4.5-month-old animals. Eight weeks later, the mice had fewer repeat-containing mRNAs, RNA foci, and dipeptide inclusions throughout the brain than did PBS-treated controls. CSF poly(GP) in the CSF dropped in parallel, correlating with reduced expansion transcripts and reduced levels of other dipeptide repeats they encode. These findings suggested that measurement of CSF poly(GP) in patients might reflect suppression of the hexanucleotide expression by potential therapeutics. Biogen plans to initiate a Phase 1 trial of ASOs in C9-ALS in the near future, but whether it will measure CSF poly(GP) is still uncertain, according to Petrucelli and co-author Jeffrey Rothstein of Johns Hopkins. Rothstein said that plans might firm up after April. Gendron TF, Chew J, Stankowski JN, Hayes LR, Zhang YJ, Prudencio M, Carlomagno Y, Daughrity LM, Jansen-West K, Perkerson EA, O’Raw A, Cook C, Pregent L, Belzil V, van Blitterswijk M, Tabassian LJ, Lee CW, Yue M, Tong J, Song Y, Castanedes-Casey M, Rousseau L, Phillips V, Dickson DW, Rademakers R, Fryer JD, Rush BK, Pedraza O, Caputo AM, Desaro P, Palmucci C, Robertson A, Heckman MG, Diehl NN, Wiggs E, Tierney M, Braun L, Farren J, Lacomis D, Ladha S, Fournier CN, McCluskey LF, Elman LB, Toledo JB, McBride JD, Tiloca C, Morelli C, Poletti B, Solca F, Prelle A, Wuu J, Jockel-Balsarotti J, Rigo F, Ambrose C, Datta A, Yang W, Raitcheva D, Antognetti G, McCampbell A, Van Swieten JC, Miller BL, Boxer AL, Brown RH, Bowser R, Miller TM, Trojanowski JQ, Grossman M, Berry JD, Hu WT, Ratti A, Traynor BJ, Disney MD, Benatar M, Silani V, Glass JD, Floeter MK, Rothstein JD, Boylan KB, Petrucelli L. Poly(GP) proteins are a useful pharmacodynamic marker for C9ORF72-associated amyotrophic lateral sclerosis. Sci Transl Med. 2017 Mar 29;9(383) PubMed. Gendron TF, Petrucelli L. Disease Mechanisms of C9ORF72 Repeat Expansions. Cold Spring Harb Perspect Med. 2017 Jan 27; PubMed. Zu T, Liu Y, Bañez-Coronel M, Reid T, Pletnikova O, Lewis J, Miller TM, Harms MB, Falchook AE, Subramony SH, Ostrow LW, Rothstein JD, Troncoso JC, Ranum LP. RAN proteins and RNA foci from antisense transcripts in C9ORF72 ALS and frontotemporal dementia. Proc Natl Acad Sci U S A. 2013 Dec 17;110(51):E4968-77. Epub 2013 Nov 18 PubMed.